Meet Katie Shuck. Katie’s a mom, instructor, blog author, and a student at Dakota State University in Madison, South Dakota. If that doesn’t make you dizzy, her passion for cybersecurity will. 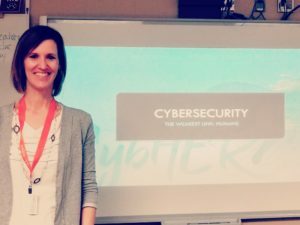 She’s currently developing content to take into schools for K-12 students, teachers, and parents to learn about online security and safety in light of recent scares that kids are facing with online hoaxes, cyberbullying, and the continued threat of online predators. 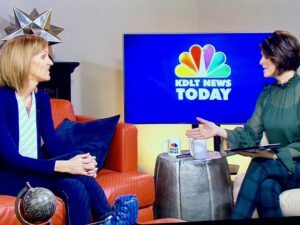 She’s a National Guard spouse, currently stationed in South Dakota, who isn’t afraid to express her thoughts and opinions, nor to seek out opportunities that benefit others. How does your day start or what gets you out of bed in the morning? My kids usually wake me up bright and early! After I get them to school, I like to start reading through current news articles and other blogs about cybersecurity topics: recent data breaches, vulnerabilities, new technology and apps. Right now, I’m developing content to take into schools for K-12 students, teachers, and parents to learn about online security and safety in light of recent scares that kids are facing with online hoaxes, cyberbullying, and the continued threat of online predators. What do you appreciate about your work environment? It’s always changing. One day I’m writing a computer program that can be used for kids to learn math, another day I’m analyzing the security of IoT devices or building my own IoT devices, and the next I’m going into schools to teach students about cybersecurity topics like online safety, cryptography, robots, or social engineering and human hacking. What is your biggest achievement to date – professionally? Being allowed to teach at the CybHER summer camps. 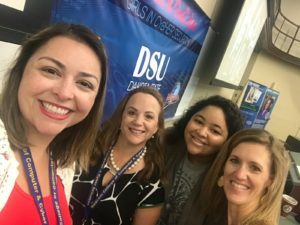 Seeing girls from so many different backgrounds who may or may not have already developed technology skills come together to learn and get excited about cybersecurity is amazing! Continuing to see these same girls come to other CybHER events and talk about how they want to go into cybersecurity education and careers is even greater! What challenges have you personally faced that your civilian counterparts may not have? Being back in school while my husband is still full-time in the military – with all the TDYs and ever-changing schedules – has been a challenge. We aren’t near a military installation and our family isn’t close by, so finding childcare isn’t always easy – especially when I’m traveling for conferences while he’s TDY. I do a lot of school work late at night after my kids go to bed. What are differences you see versus your civilian counterparts? I’m better acquainted with having to adapt and have developed a deeper “tool box” to help me with this. I also don’t let the changes scare me. Even if it’s a change I’m not really looking forward to, I am able to find the positive in it and understand that another change is just around the corner. How do you see being a military spouse or being in the military space has helped you with your job? Being a military spouse has taught me to stand up and have a voice of my own instead of relying on my spouse or others. This has greatly helped me as a woman in cybersecurity. I’m not afraid to express my thoughts and opinions, nor to seek out opportunities. What do you wish people knew about life in the military? I wish people knew that life in the military can be a bit lonely, especially when you’re stationed somewhere away from a military base. It’s hard to connect with people when you’re too busy trying just to survive because your spouse is deployed or TDY. Sometimes they don’t understand why you go to events without your spouse and ignore you. How do you feel like Professional Organizations like SMSS can help you with your career or professional goals? I love that SMSS connects not only military spouses, but people in STEM. It’s often difficult to explain my resume and all the job changes I’ve had due to military moves. Being a part of organizations like SMSS make me feel more “normal” and allow me to connect with other spouses in similar situations. What advice would you give to new spouses about being in the STEM career field? I didn’t enter STEM until later in life – because of both the constant moves and family responsibilities. Don’t be afraid to seek out opportunities in STEM if you’re looking for a career change. STEM has so many opportunities that are transportable through our military lives. There are also some great online learning opportunities to pursue STEM education and careers. 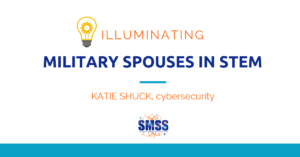 Thank you Katie for sharing your story with us and Illuminating Military Spouses in STEM. If you would like your story to be a featured in an upcoming month, please reach out to us at: contact@smsstem.org.